Before I go on, I need to warn you about something: If you decide to try do-it-yourself bed bug control, you probably will fail. You'll probably just waste a whole lot of time and money on equipment and chemicals; and at the end of it all, you'll wind up calling a professional exterminator, anyway. 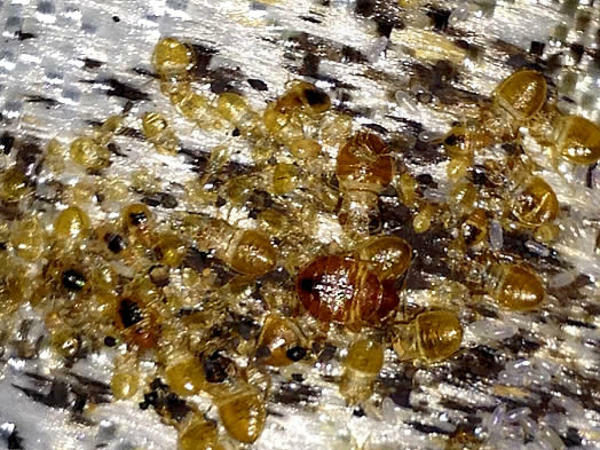 Even professionals have high failure rates when it comes to bed bugs. So before you begin, give some thought to hiring a professional if you can afford it. The reason I say this is that because of their hardiness, small size, and secretive habits, bedbugs are among the most difficult pests to control. Effective treatment often requires that pairs of exterminators spend several hours of painstaking work per room to make sure that all potential harborage areas are identified and effectively treated -- and even then, the callback rate is high. So seriously, consider calling a pro. That being said, I'm tired of getting angry emails from people because there's no section about do-it-yourself bedbug control on this site. Very well. Here is is: Scarafaggio's Guide to Do-It-Yourself Bedbug Extermination -- delivered with the disclaimer that even if you do everything suggested here, there's no guarantee that your efforts will be successful. The first step in treating a bedbug problem is making sure that you actually have one. The first sign is often the bite marks or rashes on your body or the small blood stains on the sheets; but these can be signs of other skin problems, as well. A definitive diagnosis of a bedbug infestation is best made by, well, actually finding some bedbugs (or at least their droppings). This can be easier said than done because bedbugs can hide in the tiniest, most hard-to inspect places. In your mattress or bed linens. In your box spring (including the inside). In the structural cracks, gaps, crevices, and seams of everything in your bedroom, including the walls, ceilings, furnishings, picture frames, draperies, blinds, curtains, curtain rods, electronics equipment... Let's just make it easy and say anything that a bedbug could possibly crawl into. In the switch boxes and electrical outlets. In stored clothing, carpeting, shoes, and other textile products. You get the point. Look everywhere. A magnifying glass is your friend. Once you've determined that you actually have a bedbug problem, the first thing to do is plan your battle. The most important thing to consider is the severity of the problem. If you have had one or two bites and found a bedbug or two, then maybe you've caught the problem early, and maybe you have a chance of being one of the few people to pull off DIY bedbug control successfully. But if you have more than a few bites or have seen more than a few bedbugs (or if there is other evidence of a more extensive bedbug problem, such as odors or droppings), then please do yourself a favor and call an exterminator. Still here, huh? Okay, then let's look at do-it-yourself bedbug treatment. Not being one to reinvent the wheel, I've found some good guides for you to start with before attempting your bedbug control adventure. Please download and read the Cornell Cooperative Extension "Bed Bugs are Back" pamphlet, the Armed Forces Bedbug Control Manual, and Scarafaggio's own Bedbug Treatment Preparation Sheet, which simplifies the pre-treatment tasks into checklist form. Your chances of successfully solving your bedbug problem are better if you use the right insecticides and equipment. The first thing you're going to need is a high-quality insecticide sprayer. It needs to be capable of a pressure of about 40 psi, and of producing both a pin-stream and a fan- or cone-shaped spray. If you have a classic B&G sprayer used by exterminators for the last bazillion years, great! Otherwise, a one-gallon Chapin sprayer should do nicely. You're also going to need a bulb duster. I recommend B&G Bulb Dust-R Model M1150 because it has a plastic tip, which is important when working around electrical outlets and fixtures. A Centrobulb duster is also a good choice. They're the most popular dusters used by professionals. You'll also need a couple of screwdrivers, chemical-resistant gloves, safety goggles, and an Organic Vapor/P95 Respirator. Next, you'll need some chemicals. You'll need a gallon jug (or more) of a liquid spray labeled for bedbugs, like Harris Toughest Bed Bug Spray. If you prefer something all-natural and organic, consider Eco-Defense Bed Bug Killer. Whichever product you choose, I suggest you throw away the plastic trigger spray attachment and use your compressed-air sprayer instead. You'll grow old and weary trying to do a bed bug job with a trigger sprayer. You'll probably need a bit less than a gallon of spray per room, but it's impossible to say because, obviously, your room is different from my room. If you live in a small room with no carpeting and no furniture except the bed, you'll need much less. If you live in a huge room, have a lot of furniture, have multiple beds, or have carpeted floors, you may need a bit more. I also suggest that you use one vial of Gentrol IGR Concentrate for every gallon of spray. Gentrol is an insect growth regulator that disrupts the development of bed bugs into adults. Gentrol is not labeled for mattresses, however, so don't use it on the mattresses of bed linens. You can use it on the bottom of the box spring and in the cracks and crevices of the bed frame, headboard, and so forth; but not on the mattresses or bed linens. Finally, you'll need some insecticide dust. I suggest you use either Drione Dust or Delta Dust. Drione is a natural pyrethrum product that some people prefer for that reason. Delta is a synthetic pyrethroid. I never noticed any difference in effectiveness, but Delta Dust tends to be less expensive. If you prefer a desiccant dust that does not contain any insecticide, consider diatomaceous earth formulated as a bug killer. In terms of eventual effectiveness, it's pretty close to Drione or Delta Dust. But it's much slower because it relies solely on the physical damage it causes to the bed bug's cuticle. It looks like a fine powder, but it actually has very sharp edges that scratch the bugs' outer protective surface. It's a good option if you're allergic to insecticides or just want to avoid them. You'll also need a good flashlight and a stepladder. Finally, you'll need bed bug resistant mattress covers in the correct size(s) for your bed(s). 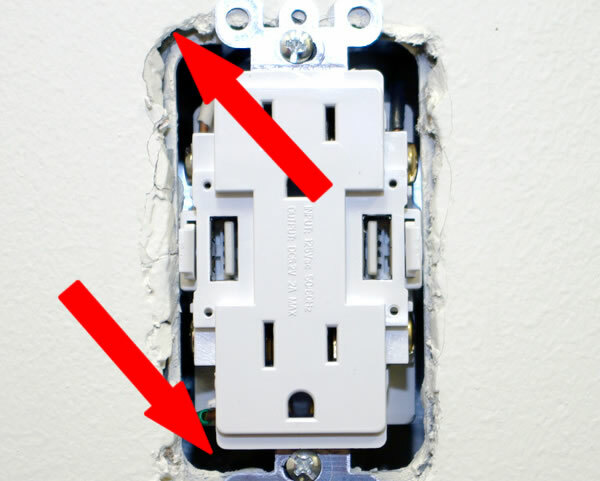 Find the circuit breaker panel for the room and turn off all power to the electrical outlets, switch plates, lights, and anything else electrical in the room. Then take your trusty flashlight and check to make sure everything's dead by plugging a test lamp, an circuit tester, or an ordinary lamp in the outlets to make sure there's no power. Also turn the light switches on and make sure the lights don't come on. You want to make sure there's no power anywhere in the room. Next, put on your respirator and goggles, take your trusty screwdriver and your bulb duster, fill the duster about half-full with whichever dust you're using, and go around the room removing all the electrical covers and puffing a little dust into the walls around all other electrical boxes, as shown in the picture. Do the same with the ceiling lights and any other electrical fixtures. When using insecticide dusts, you just need little puffs. Don't go crazy. You're not trying to suffocate the bed bugs. Use little puffs. Be careful and try to keep the dust inside the walls. None of the dusts mentioned on this page are especially toxic, but they're very irritating. While you're going around the room, puff a little dust into any cracks or holes that penetrate through to the wall and ceiling voids. Be careful not to get any dust in heating or air-conditioning ducts. When you're done, reinstall all the outlet and switch covers and turn the electricity back on. Put on your chemical-resistant gloves, respirator, and goggles, and carefully pour the gallon of insecticide into the sprayer. If you're using an insecticide that requires mixing, use the exact concentration called for on the label. Too strong a mix can actually reduce the effectiveness of the insecticide by repelling the insects before they contact it. Pump up the sprayer and set the tip to the fan or cone setting, and lightly spray the mattress or mattresses. Pay special attention to seams, tufts, and so forth. Be careful, but thorough. A light spray is enough. You don't want to saturate the fabric. If you do, then you are over-applying the product. Make sure you treat the mattresses first before treating anything else in the room. You need to treat the mattresses without using the Gentrol because it's not labeled for mattresses. Once the mattresses have been treated, bleed out the pressure from your sprayer, open it up, top it off to one gallon with the liquid insecticide, and pour the vial of Gentrol into the sprayer. Screw the pump handle down snugly and swirl the sprayer around a bit to mix the two chemicals. The reason we did the mattresses first without the Gentrol is because Gentrol is not labeled for use on mattresses. With your sprayer still set to the fan or cone setting, pump it back up and spray the box spring and any other upholstered furniture in the room (except for the mattress, which was treated already). Be thorough and spray evenly, but don't over apply. If you saturate anything, you are over-applying. Next, set your sprayer to the pin stream setting and spray all the cracks and crevices in the room, such as those around the baseboards and trim. Also treat the cracks and crevices in the bed frame, headboard, footboard, and furniture, taking care to get the insecticide into every crack, crevice, and joint. Don't miss a single one. Don't forget the closets. Next, set your sprayer back to the fan or cone setting, and spray a band of insecticide about a foot in from the corners along the walls, floor, and ceiling, where they meet each other. Finally, if the room is carpeted, spray the entire carpet, backing your way out of the room as you go. This will mean moving furniture out of the way so you can treat under it. This can take a few hours to a day, depending on the temperature and humidity. You can use the time to think about how much easier it would have been to just call an exterminator. Once they're thoroughly dry, encase the mattress and box spring with your bed bug-resistant mattress covers, and then make them up as you normally would. Put all the furniture back in place, and hopefully you're done. I suggest that you not move all of your clothing and such back into the room for a few weeks, until you're sure that the bedbugs are gone. Leave your stuff in the bags or bins in an uninfested room, and only take out what you need, as you need it. If there's still no evidence of bedbugs four weeks after the treatment, pat yourself on the back and consider the treatment a success. Bedbugs often get into electronic equipment like computers, televisions, radios, telephones, video games, and so forth. These items can be difficult to treat because, obviously, they cannot be sprayed with liquid insecticides. The two most commonly used treatments for bedbug-infested electronic equipment are heat and fumigation. Heat treatment involves placing the items in a thermal chamber, which is basically a low-temperature oven that heats the items to about 120 - 130 degrees F for a few hours. Most electronic equipment can handle these temperatures, but not much more; so temperature regulation is critical. Alternatively, some electronic items can be placed in a freezer for several days. DDVP pest strips are a type of fumigant that can be used by unlicensed people. They're also used by professionals. Nuvan Prostrips are probably the most popular brand among professional exterminators. To use them, tightly seal the object being treated inside a contractor-quality plastic trash bag with a DDVP strip, and leave it for about four days. Don't do this treatment in a living area because of the risk of the gas seeping out. When you open the bags, do it outside while wearing a respirator. DDVP is a highly-toxic compound and a suspected carcinogen, so use it with caution, if at all. Books and papers are often infested by bedbugs, and are most often treated using heat or cold. Sustained temperatures of over 120° F for about four or five hours are needed if heat is used. For cold treatment, sustained temperatures colder than -5 degrees F for at least a week are needed to treat books, and the exposure to cold must be sudden, not gradual. Commercial freezers are capable of sustaining these temperatures, but few home refrigerators are. Toys that become infested with bedbugs can be treated with heat, cold, or sometimes thorough washing. If a toy can be completely submerged and soaked in hot water (at least 120 degrees F) with detergent for a few hours, the chances are that any bedbugs in it will die. Plush toys are best discarded; but if your children simply cannot part with them, you can try washing them in detergent and tumbling them in a hot clothes dryer for a few hours.